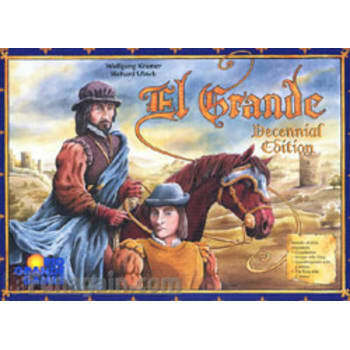 This Decennial version also contains the expansions previously known as Intrigue & the King, Grand Inquisitor & the Colonies, and Grandissimo. In Intrigue & the King, each player has 18 or 28 cards that replace the action cards from the basic game. Before the game begins, each player chooses 13 cards to be his action/priority deck for the game. The players use these cards instead of the action a nd priority cards in determining turn order and special actions. Grand Inquisitor & the Colonies adds four new regions, the Grand Inquisitor, and new action cards to support these additions. The new action cards are in two new stacks, giving players seven options on each turn instead of the five from the basic game. By combining the two, you can play The King & the Colonies. In this game, you use the action/priority cards from Intrigue & the King, and the new regions, the Grand Inquisitor, and the new action cards supporting them from Grand Inquisitor & the Colonies. Grandissimo adds a ship, jail, Portugal, the Grand Inquisitor, the Queen, the Jester, and new action cards in two new stacks to support these additions.